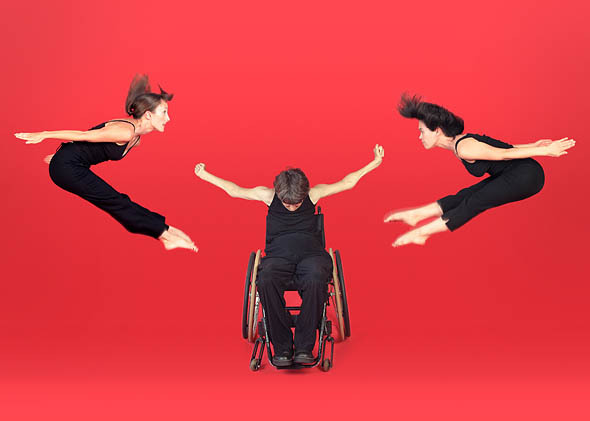 AXIS Dance Company, one of the most acclaimed and innovative ensembles of performers with and without disabilities, presents the Maine premieres of award-winning works by choreographers David Dorfman, Alex Ketley and Joe Goode. Performances take place at 8 p.m. Friday and Saturday, July 30 and 31, in Bates College’s Alumni Gymnasium, 130 Central Ave. For information about tickets, and for additional performance details, visit the festival website. Among the premieres on the AXIS weekend programs is the company’s most recent commission, Light Shelter, created by the witty and skillful choreographer and longtime Bates Dance Festival regular, David Dorfman. “The quality of the dancing takes your breath away,” San Francisco Chronicle reviewer Allan Ulrich wrote of the work. The score is by noted electronic composer Albert Mathias, another festival regular, who received a 2006 Bessie award for his music for the Bebe Miller company’s Landing/Place and also crafted music for the company’s performance Necessary Place at Bates last summer. Founded in 1987 and working under the artistic direction of founding member Judith Smith since 1997, AXIS is a jewel of contemporary dance and disability culture — a company that transforms a viewer’s perspective on dance and the possibilities of the body. AXIS has paved the way for a powerful contemporary dance form, physically integrated dance. The company has performed in more than 60 cities nationwide, as well as in Europe and Siberia. The list of AXIS collaborators reads like a Who’s Who of contemporary dance: Bill T. Jones, Stephen Petronio, Joe Goode, Joanna Haigood, Victoria Marks, Ann Carlson, Margaret Jenkins, Sonya Delwaide, Meredith Monk, Fred Frith and Joan Jeanrenaud. AXIS has received seven Isadora Duncan Dance Awards and an additional seven nominations. Offering a kaleidoscope of events for adults and youth of all abilities, AXIS is also known for its unparalleled education/outreach program Dance Access and its youth component Dance Access/KIDS!